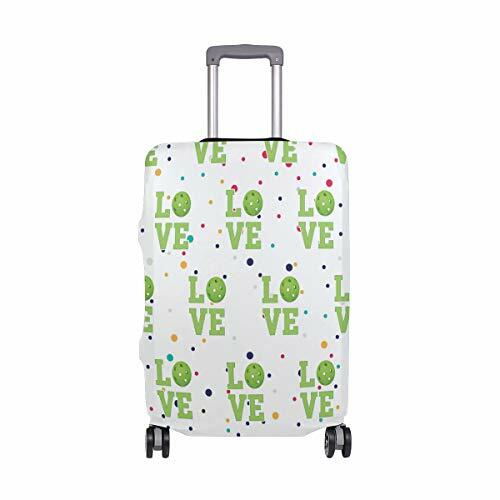 Perfect for Holiday Travel, The Unique Design, Supply You More Fun During Your Journey. - Do Not Wash with Hot Water or Alkaline Detergent. - Separate Cleaning to Avoid Staining. Note: Cover Only, Suitcase Not Included. Material: 85% Polyester+15% Spandex. Extremely Durable, Washable and Stretch; Super High Laminating, Highly Elastic. Different Size Fits 18"-32" Suitcase. S: 18"-20"/ M: 22"-24"/ L: 26"-28"/ xl: 29"-32". If Your Luggage is Hard Shell Style, Please Order a Bigger Size. Reasonable Design: 2 Openings at The Top for Telescoping Handle and Push Button Handle, Both Left and Right Side Have Invisible Zipper Closure for Side Handles. Double-Stitched All Over, Full of Ductility and High Elasticity, Ensure Your Suitcase Keep Closed During The Trip. Superior Sublimation Quality and Digital Print Makes The Pattern More Vivid and The Color Brighter. Highlight Your Personality and Identify Your Luggage Easily. If you have any questions about this product by HLive, contact us by completing and submitting the form below. If you are looking for a specif part number, please include it with your message.